Cumann Merriman's 45th annual Scoil Gheimhridh/Winter School takes place in Westport this weekend. The Merriman Winter School is conducted in the Irish language. The packed programme includes a visit to the National Museum of Ireland - Country Life on Saturday 02 February which will be followed by the launch of 'Seoladh Leabhair: Comhairle Bhéaloideas Éireann'. The book launch is being organised and hosted by the publishers Comhairle Bhéaloideas Éireann, an organisation charged with publishing material from the National Folklore Collection in UCD and related matters. Cumann Merriman will be returning to Westport, Co. Mayo, for the 11th time in all the weekend of 1-3 February for their 45th annual Irish language Scoil Gheimhridh (Winter School). The theme this year is ‘An Cultúr Dúchais - ó thinteáin go hilmheáin' (‘Traditional Culture - from firesides to multimedia.') and the directors are Máire Ní Neachtain (Head of the Irish Department, Mary Immaculate College, Limerick) and Liam Ó Dochartaigh, current Cathaoirleach of Cumann Merriman. 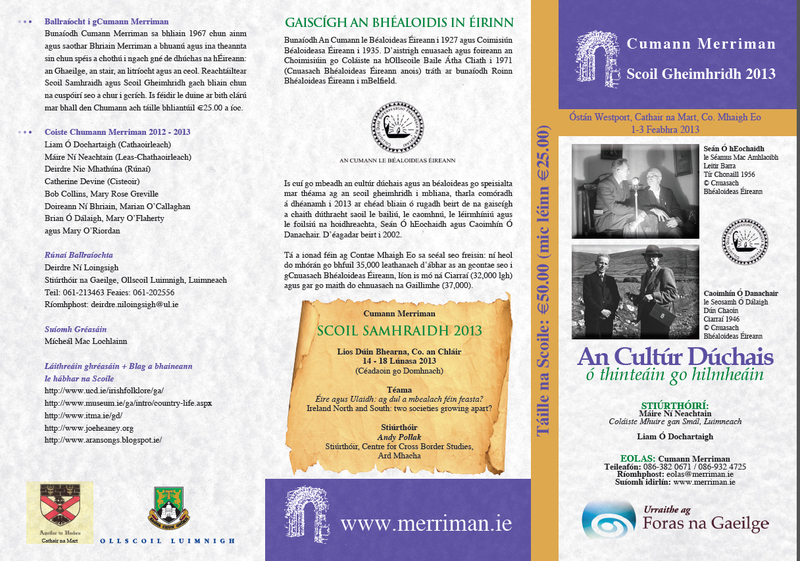 Among the distinguished list of speakers at the 2013 Scoil Gheimhridh will be the following well-known authorities in the area of folklore and tradition, Professor emeritus Séamas Ó Catháin (UCD), no stranger to county Mayo, Dr Pádraig Ó Héalaí (NUIG), Dr Lillis Ó Laoire (NUIG), Nicholas Carolan (Irish Traditional Music Archive), Dr Stiofán Ó Cadhla (UCC), and the well-known author and folklore scholar, Éilís Ní Dhuibhne Almqvist. See attached for more details or visit www.merriman.ie. Tionólfar 45ú Scoil Gheimhridh Chumann Merriman in Óstán Westport, Cathair na Mart, an deireadh seachtaine 1-3 Feabhra. Téama na bliana seo: ‘An Cultúr Dúchair - ó thinteáin go hilmheáin' agus is iad Máire Ní Neachtain (Ceann Roinne na Gaeilge, Coláiste Mhuire gan Smál, Luimneach) agus Liam Ó Dochartaigh (Cathaoirleach Chumann Merriman) stiúrthóirí na Scoile. Is dóigh leis an lucht eagraithe go mbaineann an téama i mbliana le hábhar ar mhórán slite in Éirinn an lae inniu. Dar linn féin, tír agus pobal muid ar mór agus ar luachmhar againn an talmhaíocht ‘ghlas' agus caomhnú na timpeallachta. Mórán mar an gcéanna, meastar coitianta go bhfuil cultúr dúchais an-saibhir againn in Éirinn atá caomhnaithe, nó á chaomhnú, do na glúnta atá le teacht. Níl aon amhras ná gur éirigh thar barr linn dhá ghné den chultúr dúchais a thabhairt slán isteach sa nua-aois, na cluichí gaelacha agus an ceol agus an rinnce gaelach, ach tá gnéithe eile den traidisiún béaloidis nár éirigh baileach chomh maith linn leo. Tá an saol athraithe go mór, saol na tuaithe go speisialta, agus fágann seo go bhfuil dúshláin faoi leith ag baint leis in gcultúr dúchais a chur i láthair san oideachas, sna meáin, sna hinstitiúidí cultúrtha, i réimse na hoidhreachta i gcoitinne nó fiú i ngnáthshaol laethúil na muintire. Gné thábhachtach i dtairgí turasóireachta é an cultúr dúchais chomh maith. Ceist atá le cur agus le plé: cé na slite a ndéanfar an cultúr dúchais a chur i láthair nó fiú teacht air in Éirinn nua seo an athrú saoil, nó an mbaineann sé le hábhar beag ná mór? Céard tá i ndán do na healaíona béil amach anseo? 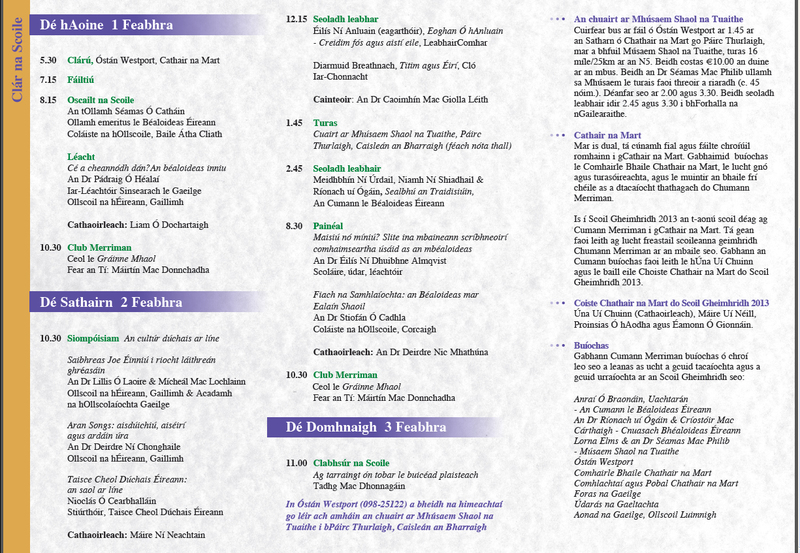 I measc na gcainteoirí ag Scoil Gheimhridh 2013, beidh údair iomráiteacha i réimsé an bhéaloidis agus an chultúr dúchais: an tOllamh emeritus Séamas Ó Catháin (COBÁC),fear a bhfuil aithne mhaith air i gContae Mhaigh Eo, an Dr Pádraig Ó Héalaí (OÉ Gaillimh), an Dr Lillis Ó Laoire (OÉ Gailimh), Nicholas Carolan (Taisce Cheol Dúchais Éireann), an Dr Stiofán Ó Cadhla (CO Corcaigh), agus an scríbhneoir agus an scoláire aitheanta, an Dr Éilís Ní Dhuibhne Almqvist. Beidh léachtaí, siompóisiam, seoltaí leabhar agus comhluadar geanúil ag an Scoil Gheimhridh agus tabharfar cuairt ar Mhúsaem Shaol na Tuaithe, gar do Chaisleán an Bharraigh, ar iarnóin an tSathairn. Beidh Club Merriman ann dhá oíche na Scoile (Aoine agus Satharn); Máirtín Mac Donnchadha (RTÉ RnaG) fear an tí agus is iad ‘Gráinne Mhaol' na ceoltóirí. Cuirfidh an Maigheoach Tadhg Mac Dhonnagáinclabhsúr ar imeachtaí na Scoile le cur i láthair pléisiúrtha na mbeidh sé ag tarraingt as tobar an tseanchais, an tsean nóis, agus gnéithe eile de na healaíona dúchais béil.